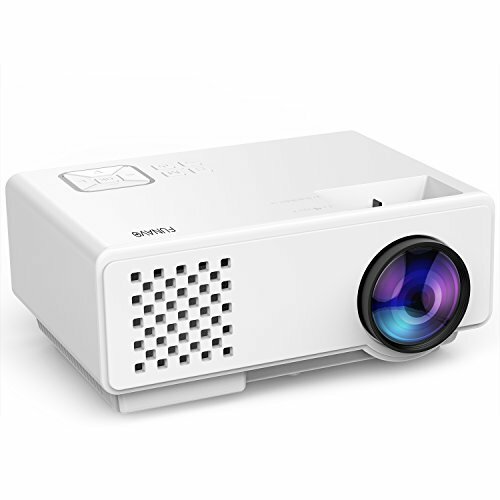 EXCELLENT VIEWING EXPERIENCE: With a new and upgraded LED light source, this projector is now 20% brighter than previous models. Together with the advanced color engine, it provides you with brighter, colorful images and rich detail. Buy Mini Portable Projector, Funavo 1080P Full HD 170” Screen LED Video Projector with 50,000 Hour Lamp Life, Supports Fire TV Stick, Smartphones, Laptops, XBOX, HDMI, VGA, SD and USB for Home Theater at Discounted Prices ✓ FREE DELIVERY possible on eligible purchases. VERSATILE MOVIE PROJECTOR: This mini projector supports HDMI/AV/VGA/ and can be easily connected with iPads, Smartphones, USB drives, SD cards, Amazon Fire Stick, TV boxes, DVD players, PCs and more, making it great for home theater, movies & video games. 170-INCH LARGE SCREEN: This video projector offers you an ultra-big display screen of 32-170 inches at a projection distance 1.5-5m. The optimum distance for this projector is 2 to 2.5m, which will display a super-sharp, bright 120-inch image. LOW-NOISE FAN & PREMIUM SOUND: The movie projector's cooling fan provides awesome heat dispersion and is lower in noise due to an improved fan design, as well as the application of innovative materials. Moreover, a built-in premium speaker restores every audio detail. 3-YEAR WARRANTY: This HD projector comes with a 3-year warranty and lifetime professional customer service & technical support is on-hand. Feel free to contact us if you have any problem. NOTE: This projector is NOT recommended for PPTs or business presentations.